Gambia’s biggest party, the United Democratic Party (UDP) has swept polls winning 62 seats of the 120 seats in Thursday’s local council elections, election officials announced. According to Gambia’s Independent Electoral Commission (IEC), the UDP led by Gambia’s Foreign Minister, Ousainou Darboe captured the highest number of seats followed by opposition Gambia Democratic Congress Party (GDC) which got 23 seats. Gambia’s former ruling Alliance for Patriotic Reorientation and Construction (APRC) of ex-dictator Yahya Jammeh now an opposition party got 18 seats. Small parties like PDOIS led by popular sociologist and politician, Halifa Sallah got seven seats followed by the National Reconciliation Party (NRP) of Hamat Bah. 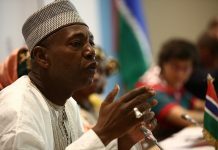 Two other smaller parties – the People’s Progressive Party of ex-President Dawda Jawara which is now led by Gambia’s Agricultural Minister, Omar A Jallow and the Gambia Moral Congress (GMC) led by former Interior Minister, Mai Ahmed Fatty each got one seat. Three councilors’ seats were won by three independent candidates who were not affiliated with any political party. Gambian voters went to polls on Thursday (April 12) to choose 120 area councillors from a total of 409 candidates in a free, fair and transparent elections. Shortly before the polling exercise, leaders of the various political parties spoke to the electorate urging them to go to the polls peacefully and cast their votes. Lawyer Darboe, after casting his vote advised the electorate that they should take the local government elections very seriously as representatives emerging from them are people who will influence community development. He also told voters to be law abiding and that all should respect the election rules throughout the process.